In today’s Scott Baio post, I rained on the parade a bit at the end by pointing out Henry Winkler’s retweeting of a Gazan. The Gazan in question has been in the news recently. 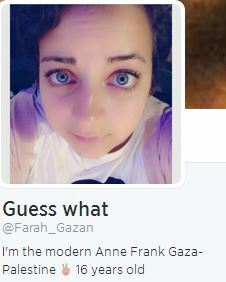 And describes herself as the Anne Frank of Gaza-Palestine. I wonder if Henry Winkler knows she has taken this iconic Jewish figure from the Holocaust and co-opted her like other Israel haters before her. I hope not, because if so, I would have to say he well and truly jumped the shark.